In a surprising touch, my experience of the first UK coffee festival was mostly ginger. The refreshing and aromatic King Ginger liqueur, and the black coffee from Martin Cawardine’s coffee roasters with added ginger syrup. The ginger syrup was supplied by the Cotswold based Taylerson’s Malmesbury syrups and the liqueur by the London based drinks company. 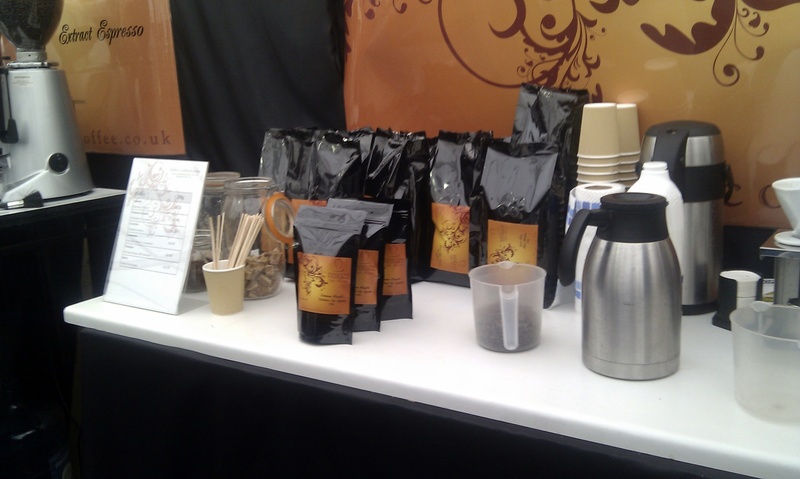 The Bath coffee festival was not a huge affair, they shared the Recreation field with some local rugby players and picnicking families, but they did have quite a range of local exhibitors and others from further afield. 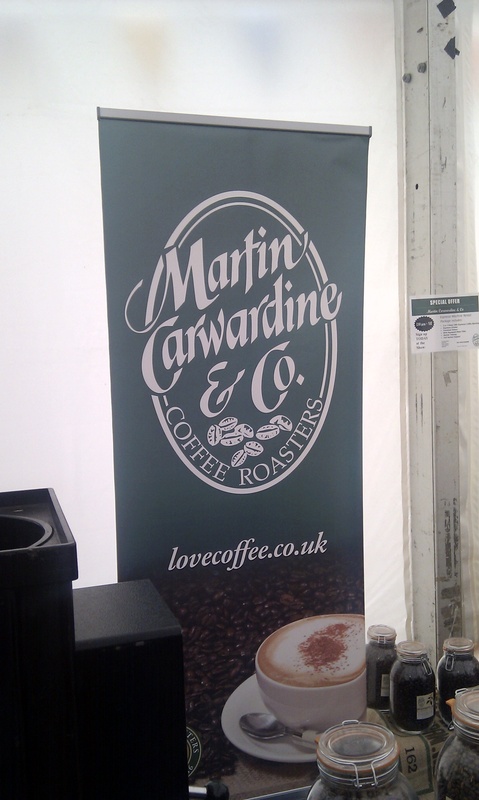 The coffee roasters Martin Carwardines & Co are based in the South West and while they are not linked directly to the Cawardine’s cafes in Bristol, they do share familial roots going back five generations. Stephen Carwardine runs the cafes and one of his sons runs the coffee roasters. They also supply the coffee for the cafes. After a brief discussion about the merits of Australia versus Bristol, I moved on to explore another local exhibition manned by people who shared my Southern Hemisphere origins. Extract Coffee is run by two New Zealanders who set up shop just three years ago and run a stall on College Green. They are looking to create a more permanent fixture somewhere in Bristol but for now have to think of a location for the shop. While there is some cost attached to exhibiting in a festival such as this, there is also an opportunity to raise awareness of the products on display to people who may not have seen them before. Extract Coffee roasters not only sell coffee to passing customers on the College Green but also sell coffee beans from their online shop. 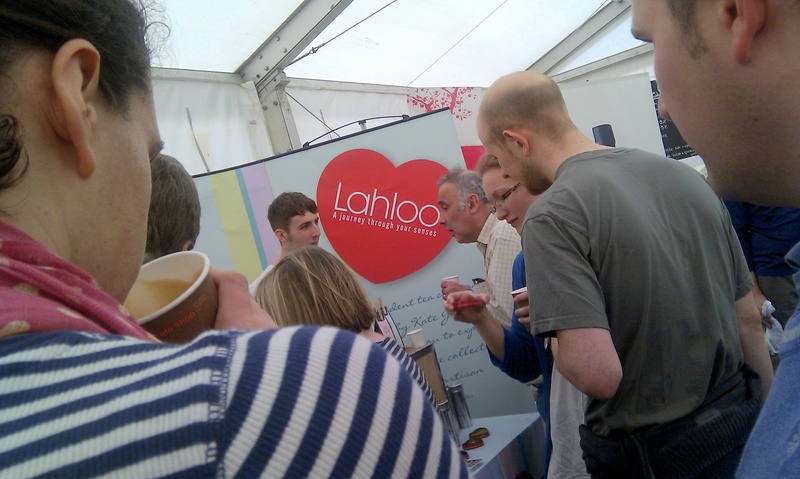 The passing festive crowds were also given the opportunity to try some tea from another Bristol based company, Lahloo tea. Their elegant and distinctive produce can be savoured in places such as the Bristol Lido and provide a wonderfully fragrant experience. I didn’t get a chance to speak to the Lahloo people because it was a struggle getting through the crowds in front of their stand. Instead I had a nice chat with the man at Orchard Pig. This stand seemed to be more local than caffeinated for there were no hot beverages in sight. I visited Bath as a coffee enthusiast but I also managed to enjoy the local aspect to it as well. The South West theme was offset slightly by the big companies such as Whittard’s of Chelsea and Royal Taylors of Harrogate but the enthusiasm was at the grassroots level with the smaller producers. The bigger companies have already established their positions in the big stores and shops. The smaller companies have still got a little while to go in order to make their presence as well known as the others. I chatted to Orchard Pig about their sparkling 4.2% cider which has yet to be bottled and sold because it still needs a design for its appearance. The local company’s products can be found in places like the Watershed and they were in fine form at the Cheese Taste Off a couple of days ago. I didn’t try any cider that morning but I usually have the sparkling apple and ginger juice when given the option. The apple juice is local too with a 75cl bottle containing over a kilo of hand picked, hand graded and farm pressed at West Bradley Fruit Farm in the heart of Somerset. The only thing left is to figure out the origins of the ginger which seemed to follow me everywhere. Perhaps another local festival will do the trick and luckily there’s one even closer to me but held in September. The Bristol Organic Food Festival is held annually and was most enjoyable last year. I hope the UK Coffee Festival gets a chance at a repeat performance as well. Update: Extract Coffee Roasters also provide implements and utensils for achieving coffee perfection. Coffee machines and shot glasses were also advertised at the festival. I skipped by them in my pursuit of coffee but am happy to browse through what’s available now that I have the time. 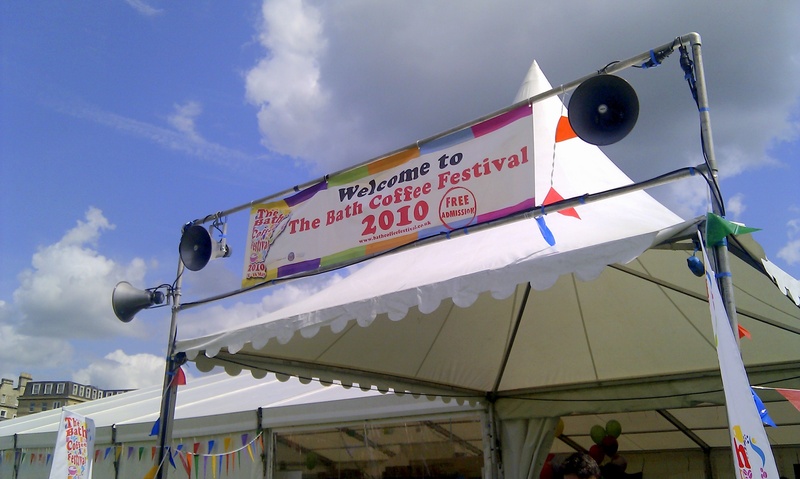 This entry was posted in Bristol, Coffee, Food and tagged Bath, Bristol, cider, Coffee, coffee grinders, coffee machine, festivals, Orchard Pig, organic coffee bean, South West. Bookmark the permalink. I’m gutted I couldn’t make this in the end…looks like the weather was fantastic too! I tried the Orchard Pig apple juice with ginger at the Real Food Festival the other week and bought a bottle to take home with me…delicious! Hopefully they’ll be back next year with even more coffee. 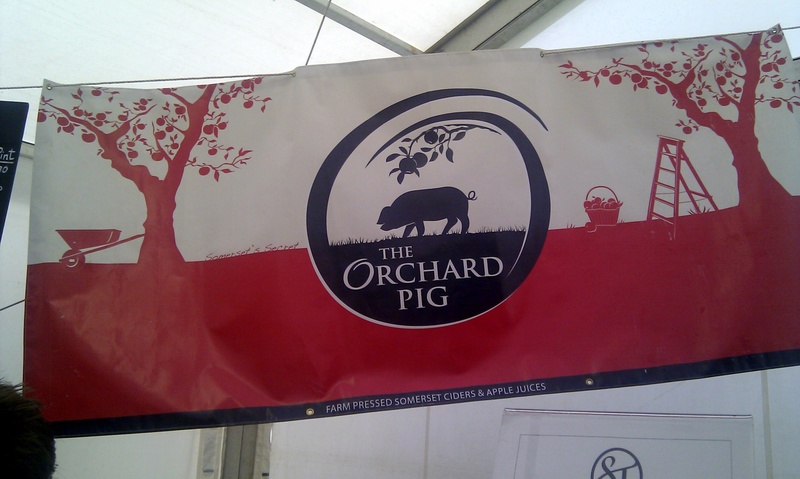 I suspect that Orchard Pig and the local stands will be at one or more of the Bristol festivals over the coming months. Hopefully you haven’t really missed out. So sorry you couldn’t make through teh crowds to come and say hello!We’ll be at Chew Vally Real Food Festival this Saturday if you’re free and if not we are holding tastings at Arch House Deli on 12th June, 17th July and 11th September so it would be lovely to meet you then. Hope to catch up soon and thanks for the mention (ps I’m not a cider fan but I loved the 4.2% sparkling from Orchard Pig)!